"Remember, the GT-R has no history here. Previous Skyline-based generations of this car weren’t sold in the US – they weren’t even made in left-hand drive – and the new one seems doubly hamstrung because, following a godlike decree from corporate overlord Carlos Ghosn that this must be a ‘global product’, it arrives in the States wearing the same Nissan badge it gets in the rest of the world rather than the well established, Lexus-baiting Infiniti tag that marks the company’s posho stuff in North America." "On the way out of town, however, we pull over on an empty stretch of road for another photo op. And as I sit there, a current-shape Corvette appears from a side turning and cruises slowly past. For a second I think about flicking him the Vs, then I decide it would be better to shout, ‘Oi! Wanna drag race, you LOSER? !’ In the end I do neither of these things. The bloke behind the wheel looks pretty massive and he may well have a gun. As he drives by I’m pretty sure that from behind his sinister wrap-around shades he’s giving me evils. Shortly afterwards a cop turns up and, since I’m parked pretty much in the middle of the road and Matt is about 40 yards back sizing up a low-angle shot by lying almost face-down on the centre line, we’re told to move along now please. It’s a good job too. I reckon that ’Vette Man could be rounding-up some of his small-block buddies to have us run across the county line. Or something. 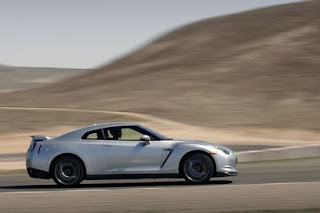 "And actually, that’s why Nissan should have no trouble selling a car with no physical pedigree in the United States. Because it doesn’t need one – it has a virtual pedigree, the same computer-game hero status that makes GT-Rs strangely cool amongst kids across the globe. Kids like this one in a Nevada Exxon garage, a kid as wholly American as Thanksgiving dinner or advertising prescription drugs on telly, but who for one brief moment speaks for all young people around the world. ‘That there,’ he says. ‘That is awesome.’"